Crab legs are delicious and surprisingly easy to prepare at home. They can be prepared in any number of ways, including boiling or grilling. Most crab legs are cooked and flash frozen before they're shipped, so you only have to reheat them. That only takes a few minutes in the oven. Place the crab legs onto a baking sheet. Brush the crab legs with butter and lemon juice. Bake the crab legs for 15 minutes. 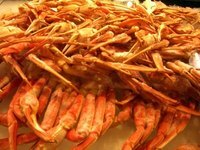 Frozen crab legs that you buy in a grocery store have already been cooked. You just need to heat them and they are ready to eat. Avoid buying crab legs that have already been thawed. Thawed crab legs lose their freshness very quickly.